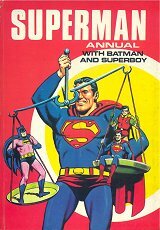 This book belongs to dept: I’ve just bought the 2014 Batman and Superman Annuals even though I’m sure I’ve read the stories they contain in earlier DC comics. But this year the production values are quite high. I like seeing the artwork on good quality paper, slightly larger than comic book size and housed in sturdy card covers. 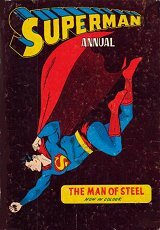 World Distributors were certainly busy in the 1960s and 1970s churning out Annuals on myriad subjects. This one must have appeared in autumn/xmas 1965. Was there one the following year? I don’t think so, but there were a number of books and magazines about Caroline in the sixties. Perhaps this 132 page hardback was originally going to be another annual about pop music and at the last minute they decided to latch onto the latest trend of Pirate Radio? There are half a dozen articles inside about Radio Caroline. Most of the book consists of info about the popstars of the time. The numerous full-page black and white photos are often rather gloomy and grainy but the book is still an interesting read. Who is this strange man and what has he done with the real Superman ? I mention UK Annuals more often than the comics they are based on for the simple reason that the durable books have survived in greater numbers than the weeklies …at least in this household. 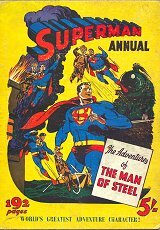 Atlas UK Superman Annuals are often advertised for sale (although at increasingly silly prices). Atlas UK Batman Annuals from the early 1960s seem to be the rarest as he then had yet to become a household name. 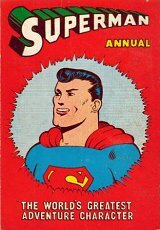 The flimsy sixpenny Superman/Superboy/Batman/SuperAdventure Australian weekly black and white reprint comics are getting quite rare in the UK now. I’ve saved perhaps two dozen for the simple fact that when I was a teenaged comic trader I never sold them because I couldn’t find anyone who collected them. 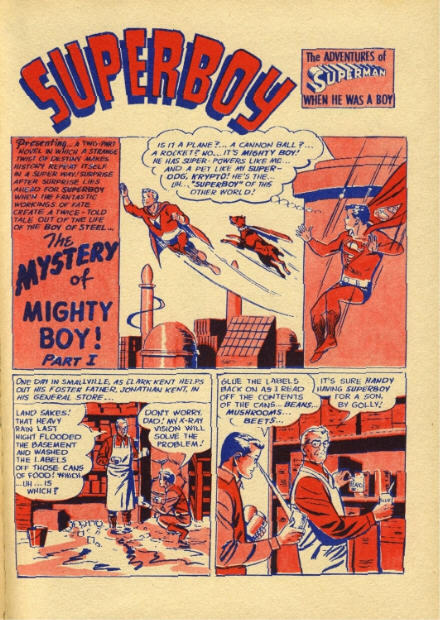 Although I have 30 or 40 Dandy Annuals, some going back to the early 1950s when it was called The Dandy Monster Comic, I know for a fact that I only own precisely 6 Dandy Comics as I’ve just kept one representitive issue from each of the last six decades !! ITEM: Looking for some cheap reading matter just before Xmas I foolishly bought a stack of 20 Annuals from a charity shop. Seemed a reasonable deal at £1 each. I’d seen them in the window the previous week and was surprised that they were still there. Evidentally the kids of today are only attracted to stuff they look at on screens and have lost the ability to turn pages in books. So I stumbled out with my haul and across the road into my next port of call, the bank. As usual the queue was massive and as usual only two girls were serving. I dumped the stack of books on the wet salt and grit strewn mess that had once been a carpet. After five un-moving minutes I sat down upon 19 books and started to read the 1982 Victor Annual !! I repeatedly dropped most of the books in the snow slipping and sliding back to the bank car park. Actually for perhaps the last 30 years my brother has given me an “ironic” Dandy or Beano Annual each Xmas (and I would retaliate with a Football Annual of some description). Annuals and Selection boxes represent Xmas just as strongly as Xmas trees and decorations. ITEM: Looking for free listening material isn’t hard these days. Although many people automatically relate “pirate” radio to pop music broadcast from boats there have been other types of unauthorised broadcasting. Today I’ve discovered the Radio Eric Website which has some fascinating stuff from land-based pirate stations like Radio Jackie etc who were still copying the 1960s offshore stations in sound and format in the 1970s and 1908s. Land-based pirates in the UK are still found in cities like London or Liverpool often specialising in urban music or reggae. There are less since downloading music from the Internet became such a straight forward way for anyone to track down their specific interests. I’ve lost interest in the radio but I do enjoy a number of Podcasts that feature music from the 1960s on. I wonder if there are there any podcasts that deal with the subject of Pirate Radio ? If not, why not ? Sometimes mp3 copies of whole vintage radio shows are just too long/hard going/time consuming. Radio Eric has numerous historical soundchecks here. Here is a short piece of audio from 1982 about the “fun” to be had as a land-based pirate evading the law. The USA had its share of land-based pirate radio stations and for a while even tried a ship-based station in the late 1980s called Radio NewYork International. The oddest American pirate Radio station must have been Radio First Termer which broadcast rock and other four letter words to the US armed forces from a brothel in Vietnam for three weeks in 1971 !! ITEM: To put things into perspective at this time of year I often recall what a friend once said. He had money trouble and a broken relationship. He despised his job teaching in an inner city school. His Xmas present to himself had been a Sunday newspaper. On the first day of the new term he surveyed the black cloud of gloom above his head and tried to find something in his otherwise bleak future that he could look forward to. All he could come up with was the new brand of toothpaste he had purchased the previous day and had yet to sample !!! PS: Isn’t the Internet/eMail spam getting out of control ? A mere 4 hours after posting the above I had already received 18 spam comments for teeth whitening……. 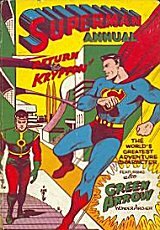 K. G. Murray of Australia produced monthly black and white reprints of some DC Comics from the late 1940s until the 1970s. 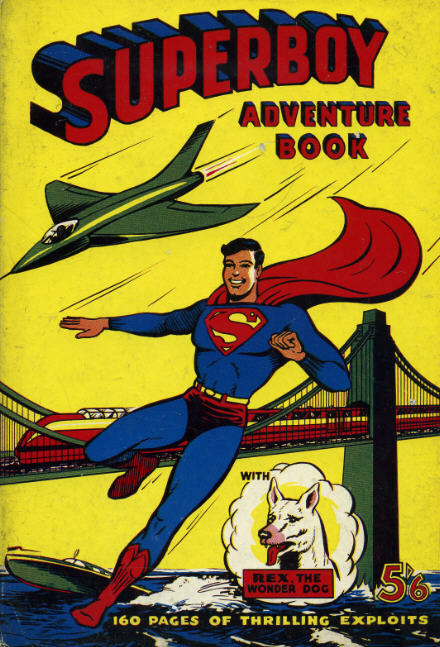 The main titles throughout the 1950s were “Superman”, “Superboy”, “Batman” and “Superadventure”. 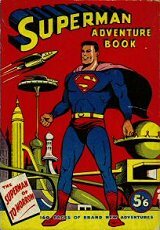 These reprint comics were reprinted for UK consumption both as monthly editions and also hardbacked 160 page Xmas Annuals. 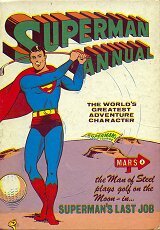 These Annuals were published by a company called “Atlas” in the UK with no connection at all to the Atlas/Timely (later to be Marvel Comics) of the USA. 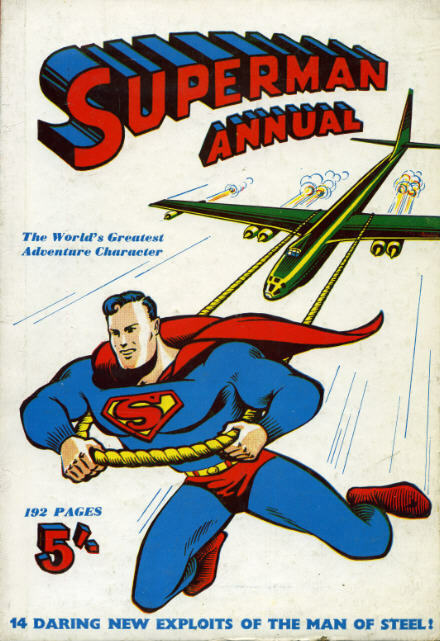 Above are some thumbnails of the Superman Annuals published between 1951 and the late 1960s. Below is the 1954-1955 Annual. “Daring new exploits” maybe. I’m sure many of the stories inside had already appeared in the UK/Australian monthly reprint comics. 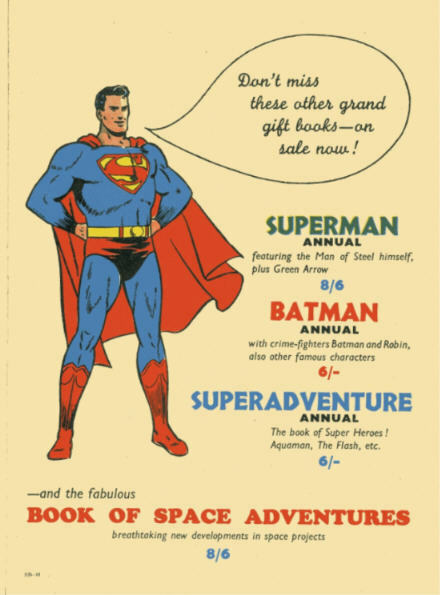 The back cover advertises some of the many Western comics available in the UK at the time. 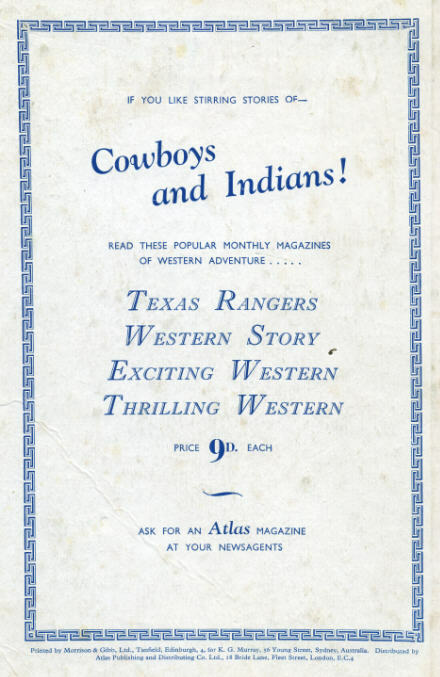 “Cowboys and Indians” also dominated the evening TV schedules. Most of the stories inside are at least 4 or 5 years old. 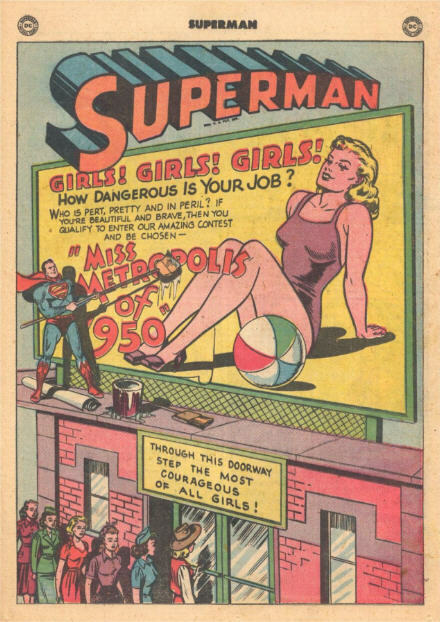 For example this story was originally published in Superman 63 in 1950. Note how the title has been changed to the more contemporary date of 1954 for the Annual. 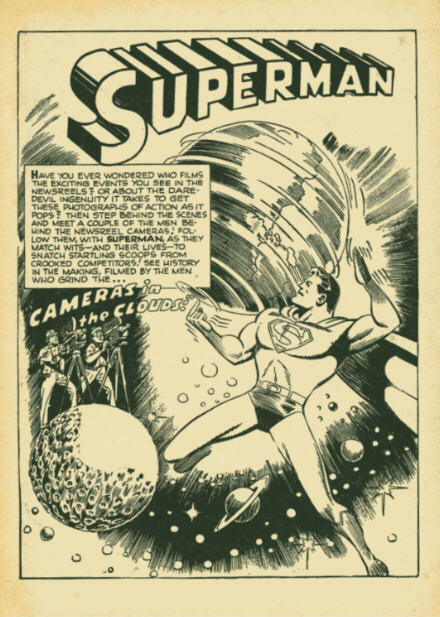 Contrast and compare with the original story splash page in the US edition Superman 63. 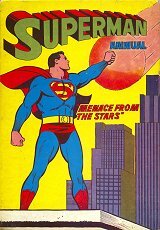 The cover of Superman 63. 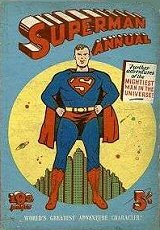 Here is the cover of the UK Superman Annual of Xmas 1956. 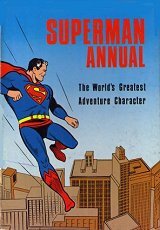 This year they call it an “Adventure Book” even though it was called an “Annual” the previous (and the following) year. The UK is introduced to Jimmy Olsen. 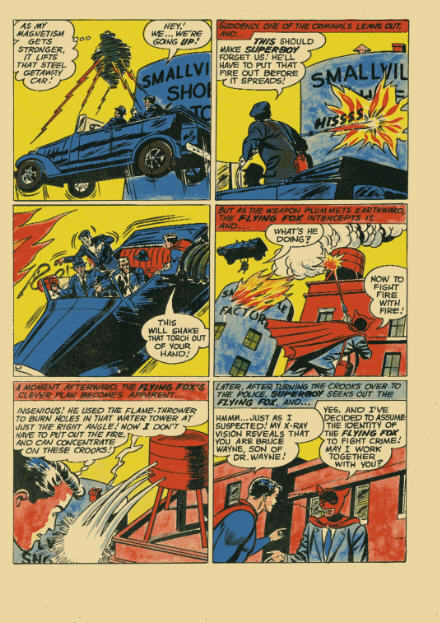 His own comic had begun in the USA a couple of years earlier. It always amuses me how in the UK in the 1950s they would go to great lengths to remove all $$$$$$s and carefully replace them with £££££s. !! These were the days before the Signal Watch. But why burn the money to send a smoke signal to alert Superman ?? I would have burnt my Jacket first !! 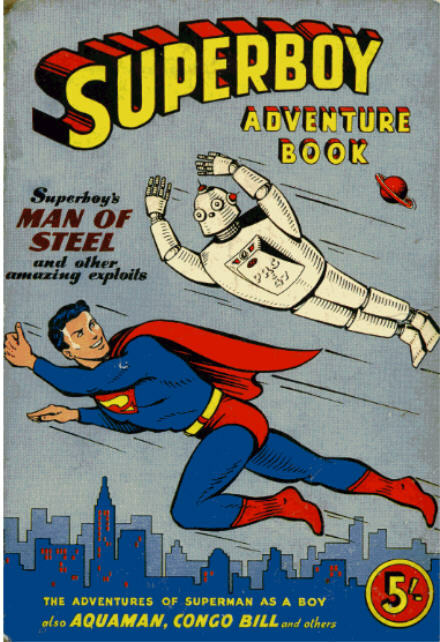 The above story originally appeared in Superman’s Pal, Jimmy Olsen No 3. 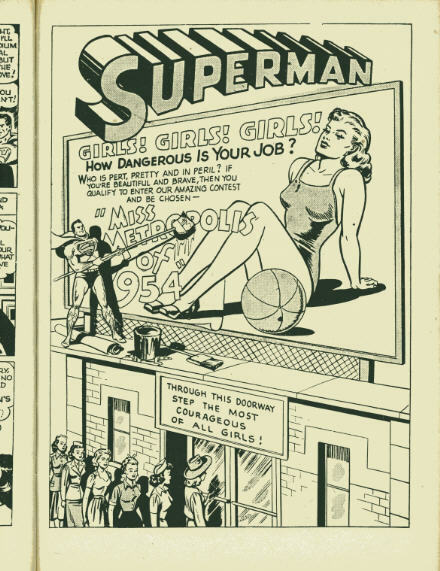 I haven’t checked when Curt Swan first began drawing the Superman books, but here he draws Jimmy quite oddly, but does draw a cute Lois Lane. 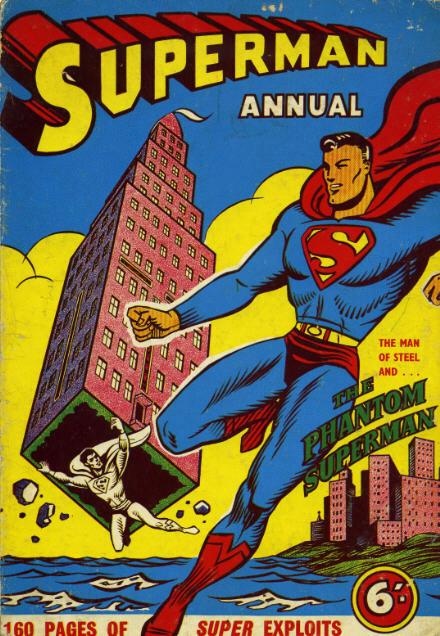 Here is the cover of the 1958 Superman Annual. The price has increased and the page count has been reduced. I like the “Superman Wallpaper” inside! 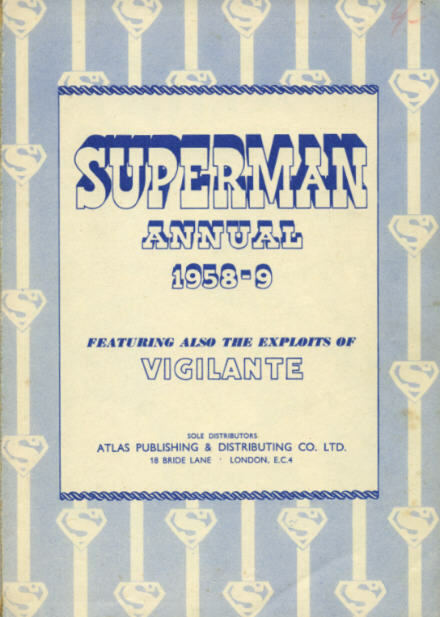 Vigilante seems an odd choice to be paired with Superman however he had appeared regularly in Action Comics a few years earlier. This Annual was on sale for Xmas 1958. Most of the reprinted stories are from the mid 1950s. 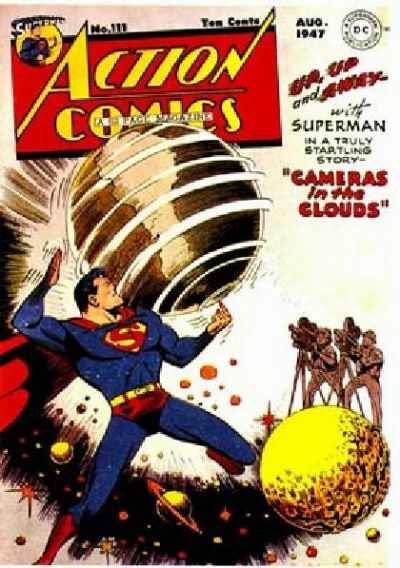 The first story in the book however was from Action Comics 111 originally published as far back as 1947. Inside was an advert for the other Annuals available. 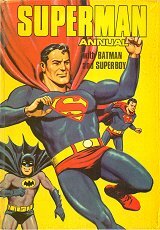 I don’t think there were any Batman UK Annuals yet. 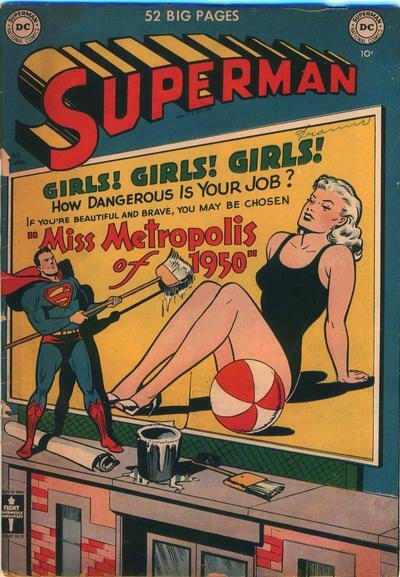 K. G. Murray of Australia produced monthly black and white reprints of some DC Comics throughout the 1950s. 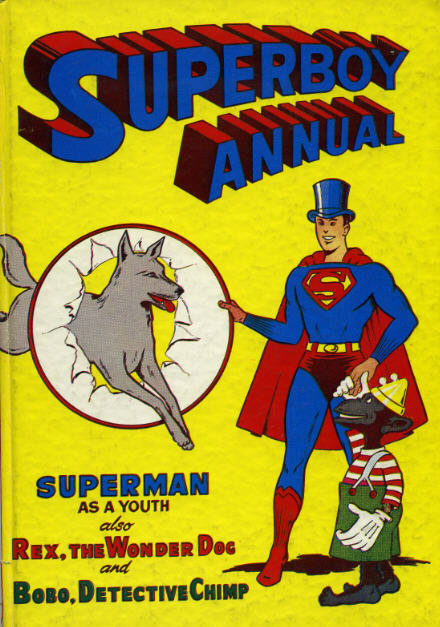 The main titles were “Superman”, “Superboy”, “Batman” and “Superadventure”. These reprint comics were reprinted for UK consumption both as monthly editons and also hardbacked 160 page Xmas Annuals. 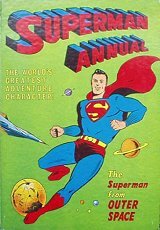 These Annuals were published by a company called “Atlas” in the UK with no connection at all to the Atlas/Timely (later to be Marvel Comics) of the USA. 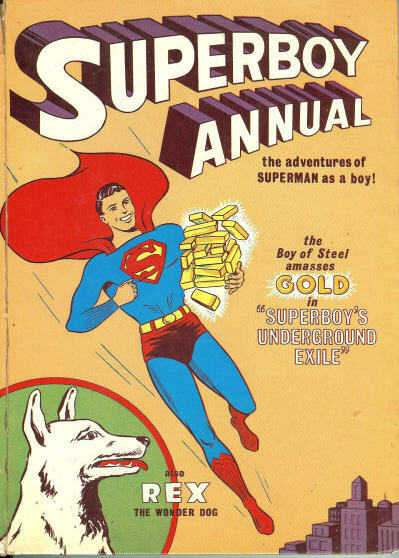 The Superboy Annuals were available for approximately 14 years, from 1953 to about 1967. 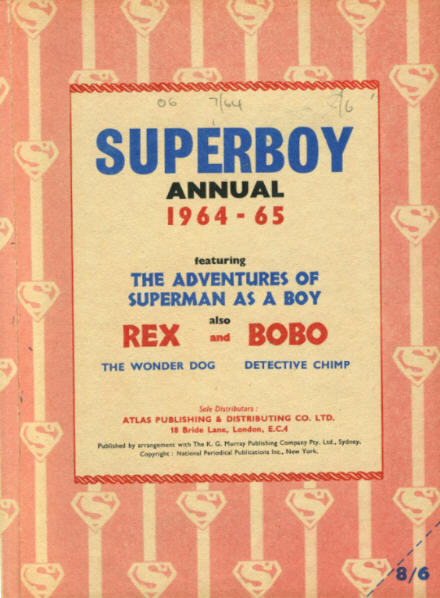 Along with Superboy stories there were always Rex the Wonder Dog and Detective Chimp stories. 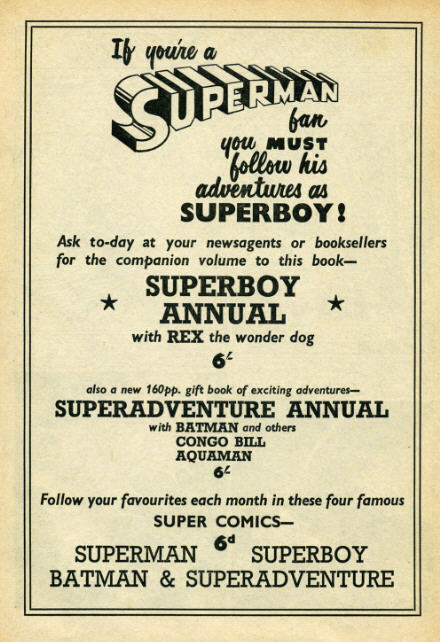 Even in the mid 1960s kids in the UK could read about the adventures of Rex the Wonder Dog and the Detective Chimp when they would have already become distant memories in the States. The quality of paper used in the 1960s books is diabolical. Many stories are in this odd red and black and white colour scheme. The stories that are in colour have evidently been coloured here in the UK. It looks like a child has been using a crayon, but no thats exactly how the book was sold!! Here is the small print from the above annual showing the connection between K.G. Murray, Atlas and Thorpe and Porter. 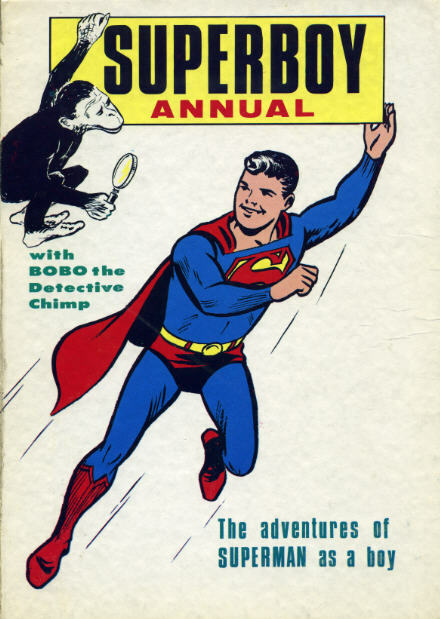 The Superboy and Detective Chimp stories in the book seem to have been licensed from the Australian company of K.G. 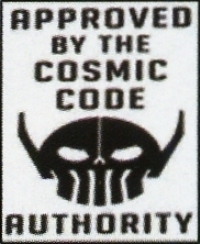 Murray, who in turn had licensed the material from National/DC. As usual the cover was no doubt drawn by someone in the UK.